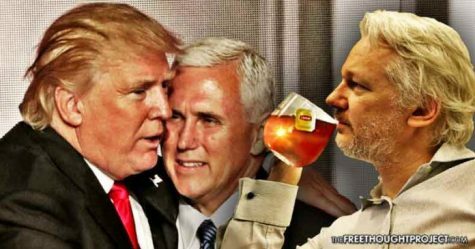 Assange’s position about the Pence coup has been acknowledged by independent journalist, Mike Cernovich, who broke the Susan Rice unmasking story, and has previously said that inside sources have confirmed that Pence is working to remove Trump in a deep state coup. Rumors of an internal coup began during the election campaign when it was reported that Pence began plotting a coup after a tape of Trump boasting about groping women was made public. The tape’s release, one month before the election, caused dissent among senior Republicans and led to several withdrawing their endorsements and calling for Trump to withdraw as the party’s presidential candidate. Pence, known as a deeply religious man, was said to be “beside himself” over Trump’s comments on the tape. Pence’s wife Karen was reportedly disgusted and called Trump “reprehensible—just totally vile,”according to the Atlantic. Sources close to the campaign have claimed that the situation was so serious that Trump held a meeting to determine what step to take next. Reince Priebus, who would become Trump’s first Chief of Staff, was reportedly bombarded with calls from party officials and donors pleading with him to get rid of Trump, with some suggesting replacing him with Pence and making Condoleezza Rice his running mate. Priebus reportedly told him he would suffer a huge defeat if he did not drop out. At the time, RNC lawyers attempted to find a legal mechanism by which they could remove Trump as the Republican candidate, while a group of billionaires attempted to offer Trump $800 million in order to voluntarily quit the race, according to the Atlantic. The fact of the matter is that Trump, while considered an outsider to politics, has operated as a consummate politician by catering to many of the special interest groups he ran on not allowing to have influence in his administration—which may ultimately be his undoing if his base abandons him as Mueller moves toward a potential impeachment. This, of course, was done as means of severing Trump from his political base, which largely opposes CIA interventionism, Zionism, and globalist banking cartels. The idea behind it being that when Mueller moves to recommend impeachment, Trump will have strayed so far from the positions that got him elected that there will be a minimal public outcry in his defense.